The HedgeHog team is proud to present yet another app solution – a circular ovulation calendar that is both simple, efficient and aesthetic. Based on the popular calendar CircleTime, Freya tells you when is the best time to try to conceive or to use protection. It can also be used during pregnancy for counting the remaining time before the estimated due date. 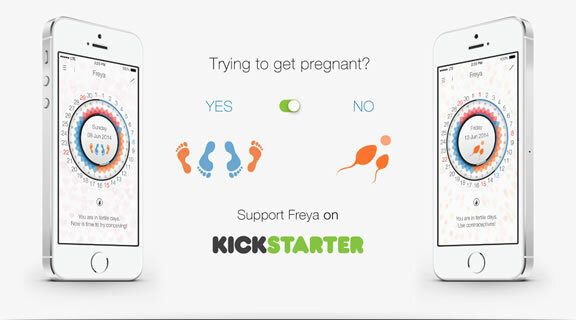 The app, named after the Scandinavian goddess of love, sexuality, beauty and fertility – Freya offers a simple solution – without the countless irrelevant information you’ll never require. Freya’s mission is to be clear and effective. We invite all who wish to see this app released as soon as possible, to assist the HedgeHog team with achieving their funding goal on the crowdfunding site Kickstarter. Participants have a unique opportunity to receive some genuine rewards made of natural and environmentally friendly materials. This is because sustainable development is one of the top priorities for the team and they wish to see all the natural beauty restored to the environment. “The purpose of Freya is to provide a remarkable menstrual calendar for women which will be immensely appealing in both appearance as well as functionality”, said Sabina Durini, Freya designer and member of the HedgeHog team. The fundraising campaign will last for 30 days and the app will initially be developed for Apple iOS devices.